There are many who credit Game of Thrones with the resurgence of the dragon in modern fantasy. But let’s face facts, dragons never really went away. A global fantasy staple from ancient times, (dragons are all over both Eastern and Western mythologies) they have also been the mainstay of some classic modern fantasy classics other than GoT including The Hobbit, Anne McCaffrey’s Pern series to name a couple. Despite this venerable history and plenty of pretenders, Anthony Ryan has managed to bring something new to the table with his swashbuckling, vaguely steampunk and hugely entertaining The Waking Fire. Ryan’s world is divided into the Blood-blessed and the non-Blessed. There are few Blessed but they are able to channel power in the blood of the dragons which live only on the remote continent of Arradsia. The blood of different dragons – blue, red, green and black – confers different temporary superhuman powers on the user. But captive breeding and over-hunting has seen the power of dragon blood diminishing. Meanwhile war is brewing between the Corvantine Empire and the rest of the capitalist-driven world ruled by individual corporations. Through these rising tensions Ryan focusses on three characters – Lizzane, spy for the powerful Ironship Syndicate, Clay, an unregistered blessed on a quest to the Arradsian interior to find the mythical white dragon, and Hilemore, an officer in the Syndicate’s navy. 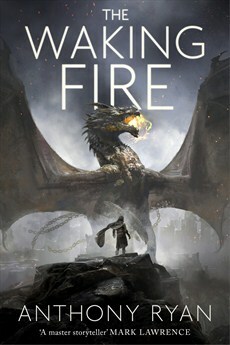 The Waking Fire has a lot going for it. Ryan has created a unique world which begs further exploration, his dragons are built on tradition but unlike anything seen before and there is plenty of action and well-constructed cliffhangers at every turn. His characters while appearing at first to be fantasy types gain depth as the story progresses and there are plenty of female action heroes. Overall this is a strong start to a great new series for fans of this type of epic but modern fantasy.